This is somewhat of a tangential update in that it’s an update of an issue referenced in a recent discussion of how suburban Atlanta will urbanize and become less auto-dependent. Tyson’s Corner , VA, located 10 miles outside of Washington, DC, is one of the largest commercial centers on the east coast, yet it has very few residents and suffers from severe car congestion (for more detailed numbers on the dramatic scope of the project see the previous article). 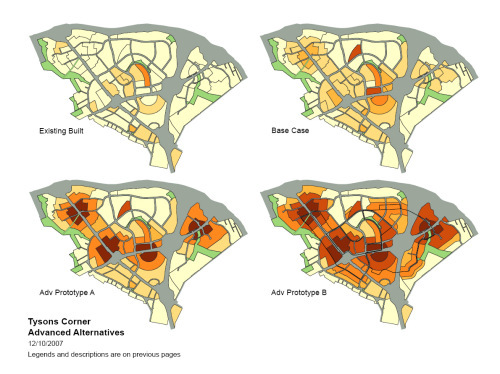 A number of years ago Tyson’s was allotted four new Metro (DC’s subway) stations and in the subsequent years Fairfax County decided to make radical land use changes to transform the area from a suburban commercial center into a legitimate city. A recent Washington Post article detailed a growing concern as the stations’ debut fast approaches: Fairfax County is providing zero parking for future riders. Tyson’s is the largest suburban redevelopment project in the country and consequently it will provide valuable information for many suburban locations, including those in Metro Atlanta, that are looking to make similar, albeit less profound, transformations. The Tyson’s redevelopment process will include many growing pains and one of them is the parking situation at future Metro stops. The County insisted on not providing parking because the entire point of the project is to make Tyson’s a self-sustaining entity that isn’t reliant on cars. 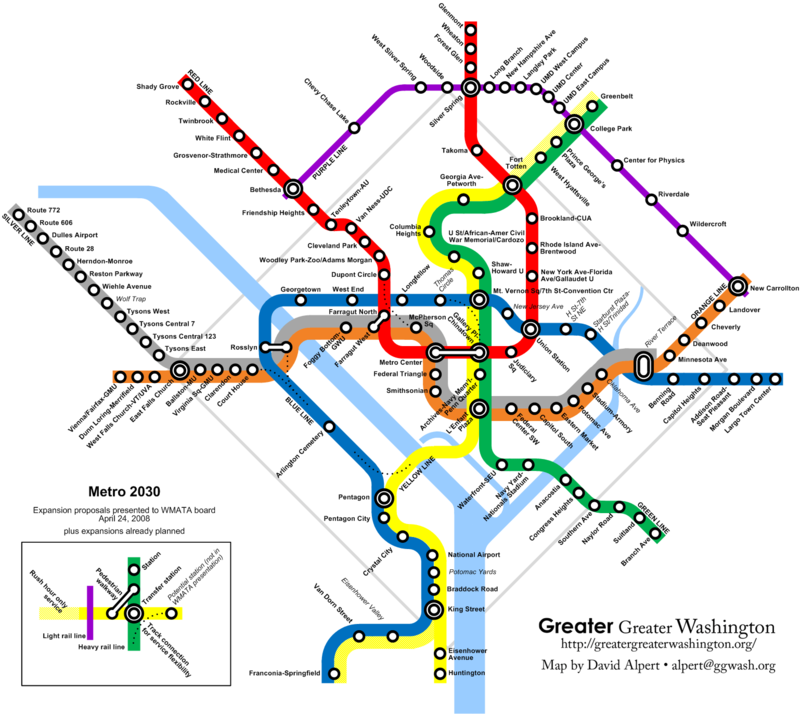 To satisfy this goal, the County dramatically upzoned areas around each station to provide more housing and commercial space, created a grid-like street system, and mandated sidewalks and bike lanes to allow people to walk and bike to and from the stations (something that nearby Arlington did very successfully). The problem is that theses improvements won’t be ready for the opening of the stations, which is set to occur next year. When the stations open, the land use features meant to allow people to walk to the stations won’t be in place and no parking will be available, so potential station users are reasonably concerned about accessibility. Residents that live just beyond the walking distance of Tyson’s stations or normally commute to other Metro stations are very much angry. They would like park-and-ride features at the new stations to cut down on their commutes. In addressing the accessibility/parking concerns, the County decided to invest heavily in the bus system for the time being. Fifteen new bus lines will be created and 28 other bus lines will be rerouted to service the Tyson’s area, while three new lines will make loops within the Tyson’s area to accommodate those within close proximity. This represents an extreme dedication towards eliminating auto-dependency and realizing the goal of reducing the amount of cars that invade local streets. The ultimate goal, and this is the County’s plan, is to have the majority of Metro riders live and work within half a mile of each station. The goal isn’t to create more park-and-ride commuter stations, it’s to create a vibrant city where the users of the stations are residents of the immediate area; no new cars needed. Caving in and creating parking garages while we wait for the new developments and infrastructure improvements seems reasonable, but it’s bad precedent. It isn’t what the plan calls for and it just creates a false sense of the future of Tyson’s Corner. The new stations were never meant to be commuter stations, so by not having parking, commuters aren’t losing something they were once promised. The point of the stations and of the new Tyson’s is to accommodate all those people that would like to live a more car-free lifestyle. Some residents are upset because the entire project seems to be social engineering; planning that is forcing people to live a certain urban, car-free lifestyle. But no force is occurring. If you would like to continue living where you live and commute to your job or commute to current Metro commuter stations then you can. The new plans are only meant to alleviate the traffic encountered by everyone by accommodating those that would like to live a lifestyle that involves less auto-dependency. Clearly there are a lot of people that desire this lifestyle. This site has mentioned numerous times (here’s one example) the many studies that show the increasing demand for a more walkable lifestyles among all age groups. Fairfax County actually attempted to acquire nearby land to use as parking to appease commuters, but only one landowner, of a possible 25 landowners of nearby vacant lots or garages within a quarter-mile of each station, was willing to use the land for commuter Metro parking. This is evidence that parking is not the best use for the land, both socially and economically. Landowners are holding out for lucrative development deals that will only continue to be in-demand as the stations come on-line and as the economy, though lazily, continues to improve. This is a project that should be watched by everyone in America. It is a multi-billion dollar project that involves transforming a largely suburban landscape into a major urban center. 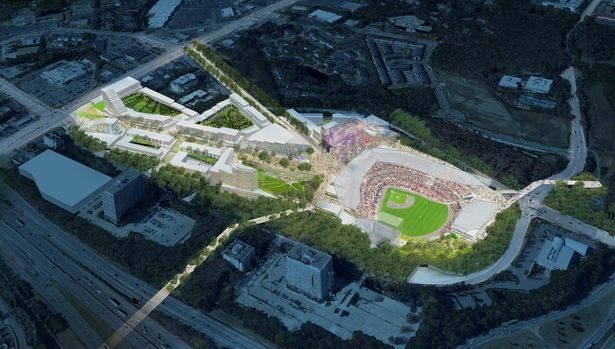 As Cobb County accepts its new baseball field, many changes will occur. Though some officials are adamantly against anything other than auto-centric development, many officials and residents would like to see new transportation options and denser development. In fact, the the plan for the area around the stadium calls for a denser, mixed-use development centered around a vibrant streetscape. Though people will largely still have to drive to this area, it is a good first-step in creating development that relies less on one form of transportation (meaning it acknowledges walking as a form of transportation). 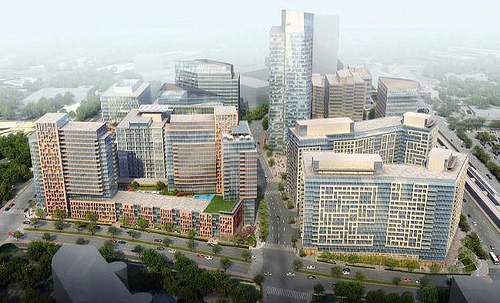 As our suburban areas look to make more dramatic changes, Tyson’s will be a great case study into the do’s and don’t’s of suburban redevelopment.